Balancing weed control, sheep feed availability and timing is a tricky job. Unpredictable seasonal rainfall has highlighted the importance of getting on top of weedy paddocks through pasture manipulation in the early stages of establishment. See the below tips for identifying and managing the most common pesky weeds in clover pastures. Getting on top of pasture manipulation early on will ensure optimum chemical action and update and reduced risk of wool and lamb seed contamination. Silvergrass quickly turns paddock into a carpet of seed stalks that sheep won’t touch. It’s always best to hit silvergrass early, ideally in May/June with a product like Simazine. Simazine has some foliar activity but is mostly root uptake hence good soil moisture or rain on the way will improve results. Applying earlier in the season when the plants have a smaller root base provides the best control and gives clovers a good chance to compete. When barley grass is prone to getting overrun with Spot Type Net Blotch disease, or growing seed heads which can potentially end up in young lambs. Brome and wild oats are a bit slower to set seed, however brome is problematic in sheep. Both are important to get good control of if going into cropping the following year. Being relatively soft seeded, 2-3 years of control in a row will drastically reduce the seed bank. For these grasses, selectives are still a great choice to maintain clovers. Quizalofop (Targa/Leopard) is the most common choice, with a switch to Haloxyfop (Verdict) if Geranium is also present. Again, it is advisable to tackle early, as these weeds work through foliar uptake and rely on getting good contact on the plants. Take your sheep out a fair time before spraying. Big, older plants with larger root systems do have the risk of re-shooting, however grazing pressure after chemical uptake (after the WHP) will work a bit like a double knock and reduce this. Any escapes can be pasture topped later. The correct course of action with rye will depend on your overall rotation – are you going into a heavy cropping phase or looking to keep a lot of pasture in the mix? Manipulation through selectives is an option, however you must be aware of your herbicide chemistry if you also have canola/lupins in the rotation and are using a lot of Clethodim (Select), watch out for resistance. As Rye tends to set seed later, pasture topping may be the better option if going into a cropping phase. It is advised that you are harsh, and sacrifice some clover seed to get good control with glyphosate or paraquat, remembering coverage is critical for these contact products. Capeweed is terrible feed for sheep. 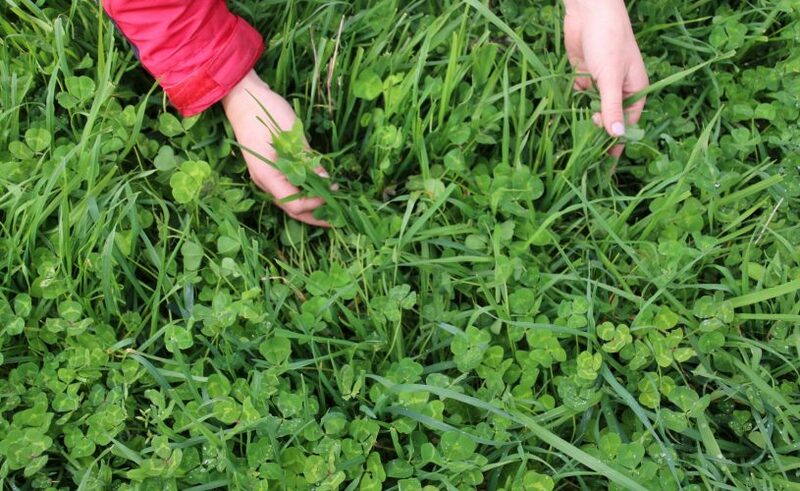 High water content and often high Nitrate levels leave very little nutritional value, and it is very competitive with clovers; stealing moisture and nutrients. Spray graze tactics are often used with capeweed products so be particularly conscious of the grazing WHP’s as some are quite long. There are several options for apeweed. Burn down, fast acting products such as Ecopar rely on good contact and coverage and degrade the plant quickly, whereas slower acting products such as bromoxynil and MCPA are slower acting hence often work well in conjunction with heavy grazing to remove biomass. Simazine, if used early for silvergrass, will also help to suppress the capeweed if it is small and young. Often, we want to kill more than one weed at a time and minimise time in the boomspray by reducing the number of passes over the pasture, so speak to your agronomist about what potential mixes will work best for you and when is the best time to apply them to maximise clover growth and gain weed control. If you have different pasture species (Serradellas, Medics) or weeds (Double Gee) check the labels to ensure pasture safety and effectiveness. It also pays to check efficacy of applications as populations of Barley Grass that are resistant to Quizalofop, and silvergrass resistant to Simazine, do exist in Western Australia. The key to pasture manipulation is to be proactive and plan your spray timing into the program so it doesn’t get left until all the cropping and spraying is done and the weeds are too big to get good control. Although it may seem harsh taking away early grass feed and having to supplement feed for a bit longer in autumn, this activity pays off at the other end of the season. The clover will grow more biomass with less competition, it will set seed better, and feed in spring will not turn rank as quickly. You also won’t have barley grass in lamb’s eyes and or high seed/Vegetable Matter percentage in wool. Sheep will likely also remain in better condition going into lambing, and will maintain growth/lactation through spring. If you really want the early grass feed, make sure it’s a species/variety that has lower risk like ryegrass. Remember to purchase your crop protection and/or canola seed at Elders between 4 February and 31 March 2019 and register to enter the draw to WIN one of 30 $3,000 Flight Centre vouchers or $3,000 EFTPOS cards. Find out more and register here. Information written by Helen Duncan, Elders Narrogin, 0429 950 334. The information contained in this article is general in nature and does not take into account your specific circumstances. Before undertaking any pasture manipulation activities, contact your local Elders agronomist.